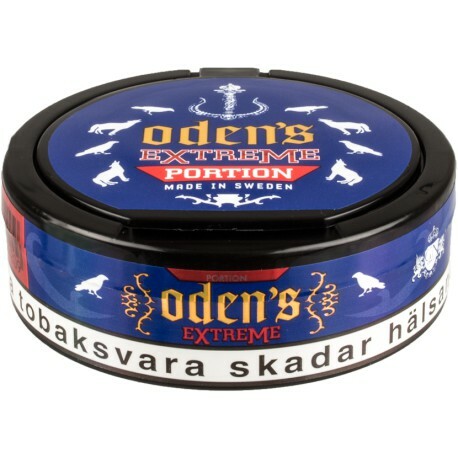 Oden's Extreme Licorice Portion Snus has a flavor of tobacco, fresh licorice and the strength of an Oden's Extreme! Oden's Extreme Licorice Portion Snus has a flavor of tobacco, fresh licorice and the strength of an Oden's Extreme. Strap in and enjoy your snus! The nicotine hit was great but the taste was awful. To my taste buds it tasted like an old licorice that had set out for a few days. Unfortunately I won’t be sticking with this. nice flavor. not my favorite but it does mingle licorice and tobacco flavors well. i gave a 3 because it was short portions. 4 otherwise. Just what I expected in taste & strength. I bit disappointed my can only had 17 portions. Is it suppose to have 20. maybe it a CC issue. Anyhow got one can to try so far I like it. If you are a fan of licorice you will appreciate this snus. Be prepared for the nic kick though. Excellent product that is well crafted. it has a wonderful licorice flavor thats sweet but not too sweet. the nicotine hit is immense. my only complaint is that the flavor only lasts for an hour, i feel like the scientists at GN could make a longer lasting snus. These taste exactly like the regular Oden's Lakrits do, so I enjoyed them as a change up. I applaud Oden's for taking the feedback of their customers and making new snus based on that. For me, I'm more of a plain tobacco kind of guy, but I think that tobacco and licorice pair pretty well together, so I've now actually crossed over to liking licorice flavored snus.